Qualcomm has announced its latest Snapdragon 845 flagship chipset. 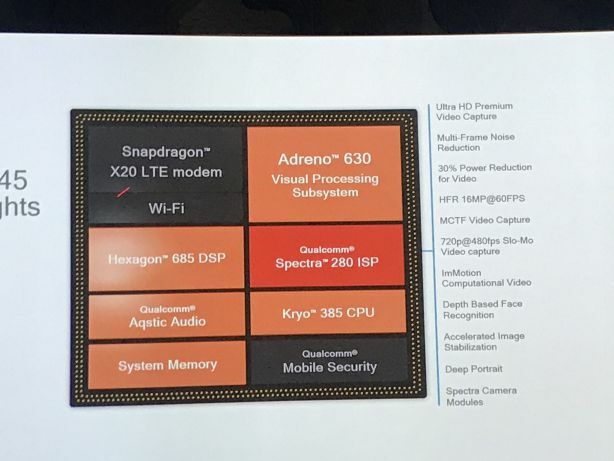 The new Snapdragon 845 packs an octa-core CPU, clocked at up to 2.8 GHz, as well as a new GPU and AI platform, based on the Hexagon 685 DSP. According to the company, there will be an overall “25-percent performance uplift” over the previous generation. The eight CPU cores also called Kryo 385 will bring better performance. The four cores are based on the Cortex-A75 architecture, while the other four are for efficiency, and based on the Cortex-A55. The Adreno 630 GPU will handle the graphics department. Qualcomm promises 30% faster graphics and 30% better power efficiency with the new chip. Thanks to a 2.5x faster display throughput, a 2K x 2K display should be able to efficiently run at 120 Hz using the new GPU. Qualcomm is also touting VR and AR capability right out of the box, including eye tracking, hand tracking, and multiview rendering. The new Hexagon 685 DSP will also work as an AI image coprocessor. This will make voice assistants three times faster than the previous generation. It will support Android 8.1 Oreo’s Neural Networks API for improved always-on keyword detection and super-efficient voice processing. Qualcomm will start shipping the new chipset to smartphone manufacturers in early 2018. The first flagships with the Snapdragon 845 will be the Xiaomi Mi 7. Samsung Galaxy S9 will also feature this new chipset.